Savery Creek Furniture - Savery Creek Signs and Furniture. Aspen Corner Bookshelf, Aspen Corner Cabinet, and Aspen Table with six chairs. Savery Creek Signs and Furniture in Savery, Wyoming specializes in custom aspen and lodge pole furniture. Each piece of furniture made at our shop is a one of a kind piece made specifically to fit your space. The log poles are hand chosen piece by piece from deadstanding pine and aspen trees to ensure quality craftsmanship and style that will last a lifetime. Every piece of our wood is hand sanded and then finished with either a poly-acrylic lacquer or a deep treating oil finish. These finishes have been chosen to bring out the beautiful and unique grain of the wood and enhance the overall durability of your furniture piece. pieces into your home, we would love to help create a unique piece for you. We hope you will browse our gallery to see some of our recently finished projects. Delivery charges will be added. Prices may vary depending on the size. Call anytime with questions or to have us plan your lodge pole or aspen one of a kind piece. 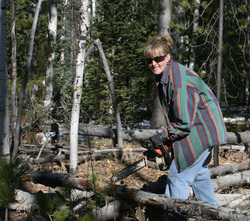 Spending a beautiful fall day gathering wood in our mountains.